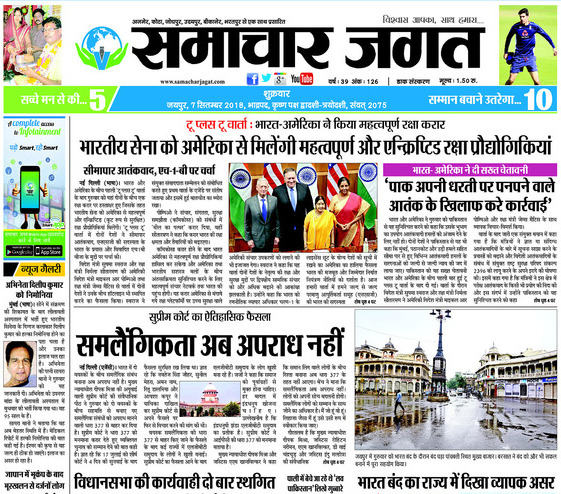 Samachar Jagat is the only Newspaper which in addition to its regular morning edition has an evening edition as well. It enables us to be at the forefront in providing latest and the breaking news at all hours. Moreover it extends our reach to so many who may have missed our morning editions. We always aim to cover each and every segment of the society not with standing their cast, religion, economic status and give due emphasis to all the adverse viewpoints. On the social side it has been our endeavor to connect to the society on a person to person basis by drawing attention and highlighting the difficulties and limitations faced by the common man in order to pave way for discussions or policy formation with an aim of providing solutions in all the sectors and sections of the society.